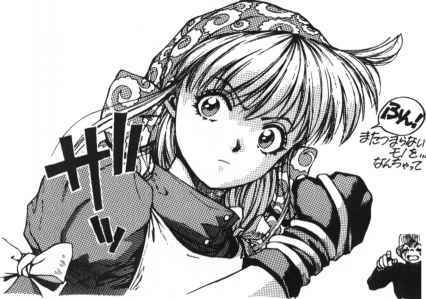 By Yu Kinutani/Media Works/Dengeki Comics EX/ from "Angel Arm"
By Yu Kinutani/Media Works/Dengeki Comics EX/from "Angel Arm"
Go ahead and draw the face of one of your original characters. As you do so, think about the drawing and the shape. 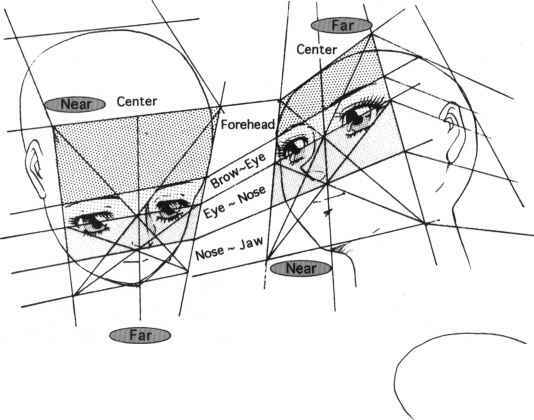 You will see how flat the side of the human face is when eye position and ear position are connected with lines. 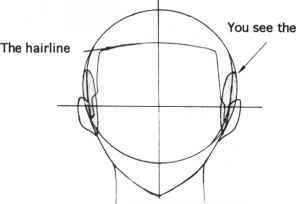 Also, if the ear position is carried up by line, you see it will intersect the center of the bisecting line of the head. The human skull is composed of two parts, the upper portion of the skull and the lower jaw. These two get together and become one. 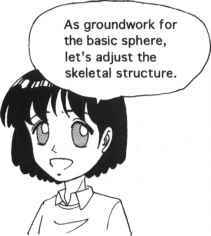 - If you understand \ figures 1-3, you can draw simple, skeletal structure based on that. Eye and ear lines r should be positioned ^ a little bit lower, considering that you will add the lower jaw. When you have drawn the basic skeletal structure, calculate where to draw the eyes, nose and mouth and draw them. I wonder if the eyes should be positioned in the center of the center line. vertical line from the ear. 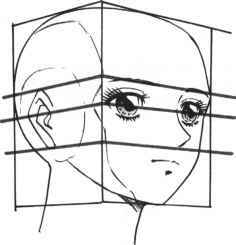 As the next step, draw positioning lines as in the diagram as if the entire face were the side of a box. Now angle the lines. With different perspective, facial proportions will change accordingly. 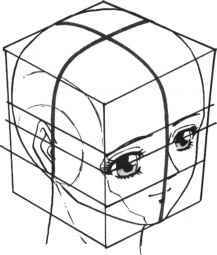 First, partition the face into four squares, then draw the diagonals to find the center. Assume that the eye position comes to the center. When the figure on the left is angled, you will get the figures below. This is a figure seen from above and from below. 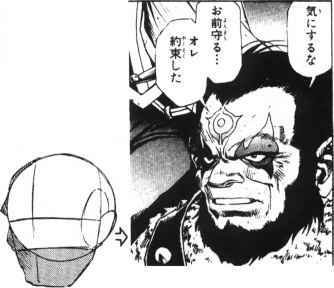 You will see that if you draw from near to far then the proportion of the forehead will become different. 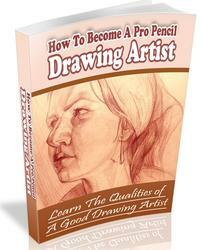 You do not have to formally draw out all the structures while drawing. The distance between eyes and brows becomes wider when looking up at the figure from below,and narrower all of a sudden when looking down from above because the brow is located a little bit ahead of eyes and the eyes are inset. Rather, you should just keep them in mind. Let's draw figures that appear quite natural. When the basic skeletal structure and the position of eyes and nose is decided then adjust the facial contours. 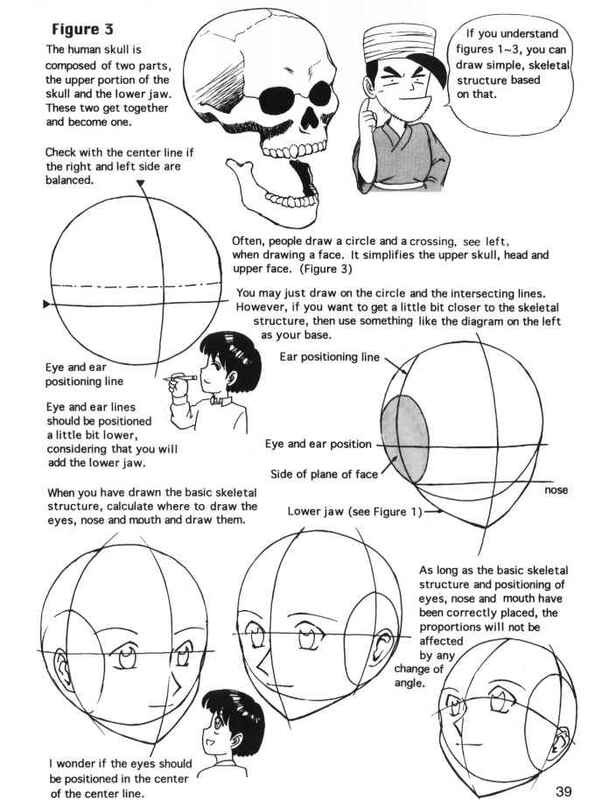 There will be no problem as long as the skeletal structure of face.is drawn in accordance with the basic skeletal structure but if not then adjust it in your own way. Some patterns do not require drawing a plane of the side of the face. By the way, the way that Mr. M draws is this. 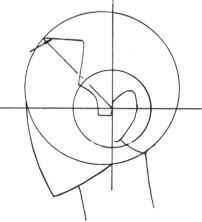 This is the position V of the ear. The circle alone forms the basis of the entire facial pattern. Add the lower jaw and adjust the outline of the face. The way Mr. M draws can be applied to many other drawings. How to draw skeletal structure differently. Just as in the cartoon by Mr. M many different skeletal structures can be obtained by just changing the lower jaw. 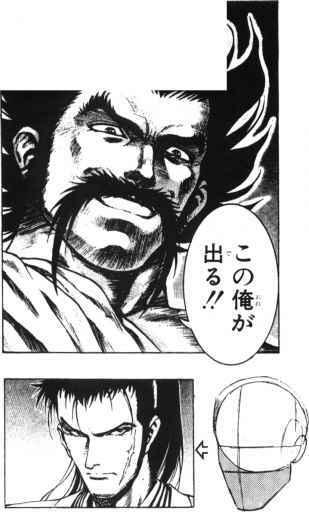 By Yu Kinutani/Enix/G Fantasy/from "Lucky Racoon"
The jaw structure is very stalwart. Draw the jaw a little bit longer. Please pay attention to the position of the cheek bone. Where is the ear position on the face supposed to be drawing? 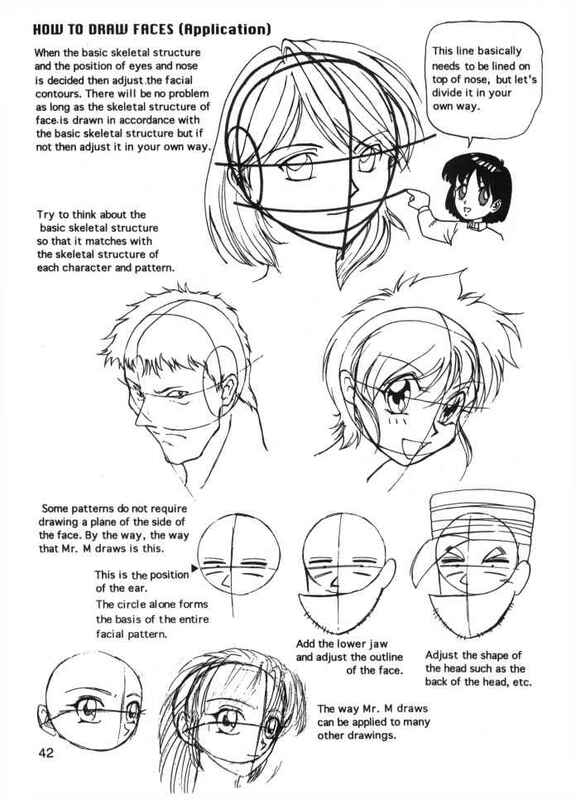 How to draw a face step by step manga? 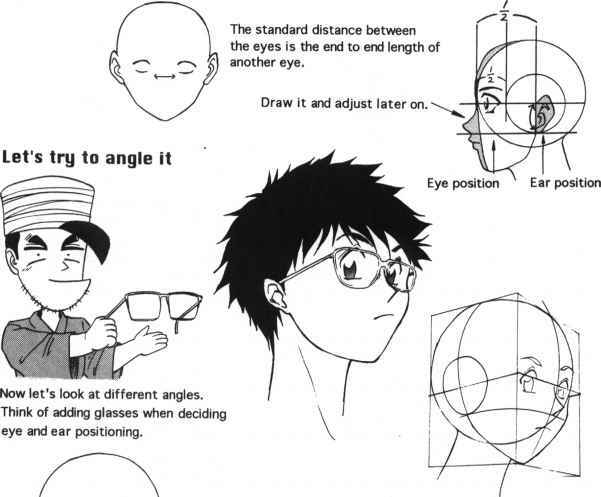 How to draw anime in angle? 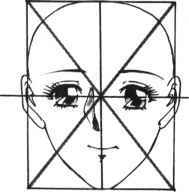 How to draw anime manga face? How to draw character angle? 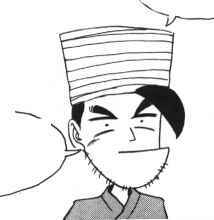 How to draw manga face portions? How to draw character face? How to draw manga animal? How to draw a anime angel step by step? How to draw face step by step comics? How to draw angel faces?